When it comes to breastfeeding in public, most new moms want privacy because it is a special bonding moment with their little ones. Although there’s nothing wrong or shameful in nursing your baby on the go or at family gatherings, it is best to use a special cover that will play two roles: keeping your baby safe and close to your body while also helping you avoid any potential awkwardness. To help you achieve that state of intimacy with your infant, I have come up with some of the best nursing covers available on the market. *The following products were listed in no particular order. I have selected them based on their features, versatility, level of quality, and users’ reviews. This is a highly convenient and versatile cover due to its multi-purpose features. Besides being a breastfeeding cover, the Nursing Cover by Hicoco can also be used as a car seat cover, a high-chair overlay, or even a shopping cart cover. The product is manufactured from a breathable fabric which is also soft yet stretchy. As a client, you will also receive a matching carrying bag that makes the cover easy to carry around or to store in your home. There are three patterns that you can choose from classical arrows, black arrows, and cute elephant design. The Hicoco Canopy Nursing Cover costs $12.95. Check out the latest prices on Amazon. This Soft Nursing Cover by Matimati Babyis a baby product that can perform 5 different tasks. It will enable you to breastfeed your infant anywhere you are by providing total privacy while also protecting your child from bugs, germs, sunlight, etc. The cover’s material is breathable but let’s find out more advantages and downsides of Matimati Baby. You can purchase the Matimati Baby Cover for the price of $16.99. Check out the latest prices on Amazon. This blue and gray overlay has a soft and stretchy material that covers baby car seats easily. The Cool Beans Stretchy Cover comes with a storage bag, and you can choose your style, selecting from no less than 7 different available colors and patterns. With the help of this product, you can now feed your baby anywhere with confidence and plenty of privacy. Unfortunately, the cover is not as breathable as one might think and it can get pretty warm underneath it. Those of you who want to give this product a try can purchase it on Amazon. The Cool Beans Breastfeeding Cover is sold for the price of $17.77. Check out the latest prices on Amazon. There are many baby covers out there, but not all of them are made completely out of cotton like this one, which, in my opinion, is a major selling point. The Babe au Lait Cotton Cover resembles an apron that creates a motherly nest for your child. The cloth’s measurements are 26 inches by 36 inches. There are 10 different colors and floral patterns to choose from, and all of them are simply delightful. Compared to many other similar products, Bebe au Lait cover has a higher price but, considering that it is made from cotton, I believe the price is pretty fair. The price of the Bebe au Lait Nursing Cover varies a little, depending on what pattern you decide to purchase. The product’s cost ranges between $25.49 and $36.38. Check out the latest prices on Amazon. The Kyapoo Breastfeeding Layover is one of the most affordable products of its kind. It provides full coverage, and it comes with an adjustable neck strap. This apron is made from cotton, and it is both breathable and lightweight. It is easy to clean and easy to use. There are three available patterns and colors that you can opt for: blue (with blue and white stripes, moons, and stars), pink (with cactuses), and light blue (with clouds). When folded, this apron becomes as small as an umbrella. For some new moms, this apron is a little narrow. 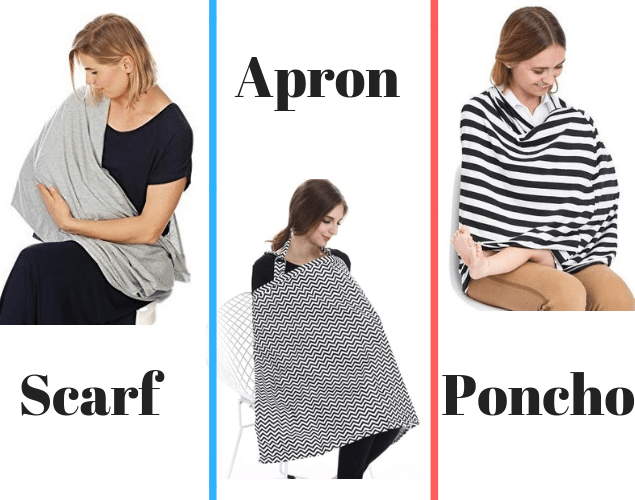 The price of the Kyapoo Breastfeeding Cover ranges between $8.99 and $12.99, depending on your chosen design. Check out the latest prices on Amazon. By using a nursing cover, you will be able to breastfeed your baby when you’re at a family gathering or out in public and it promotes an even closed bonding with your child. Therefore, I recommend you to purchase one and see how well it works for you. But, with so many options out there, which one should you pick? Well, if you ask me, all the products listed above are some of the nest nursing covers on the market. Still, if I had to choose only one, I believe I would go with Bebe au Lait because it is made from cotton and the neckline remains open so you can look at your baby. All in all, regardless of my personal choice, I am sure there is a nursing overlay for you in my list so feel free to choose whichever you like most. Organic Prenatal Vitamins: Worth the Investment?